Google Now might have gotten a ton of new features like movie and restaurant recommendations in Android 4.2 Jelly Bean, but one amazing new feature has quietly started appearing for various users - a pedometer. This seems to be a GPS-based pedometer that has been quietly calculating how many miles you walked or cycled so far this month. This is pretty cool, especially given the fact that we haven’t heard it mentioned anywhere officially by Google. It also is a brilliant illustration of the huge possibilities for Google Now. We are not yet seeing that card appear on Google Now, but you might already have it. Let us know if so, and how do you like it? i think it is a classic idea, but allow me to ask something. isn't it a breach of privacy for google to record your movements via gps? obviously that is now the information is collected. so google has info where exactly you went. however, it is possible i have it all wrong. in that case could someone clear it to me? I'm sure it is not using GPS as I occasionally turn it on. Awesome, every application will merge in Google now as truly assistant. yeah I noticed it on my GneX this morning. awesome. I presume this only really works if you've had your phone surgically implanted so it is with you absolutely all the time? I wonder how it records bedroom gymnastics? I'm assuming it works by guessing your mode of travel based on your speed. Driving slowly would probably count towards biking miles. Apparently I walked 86 Kilometers. It must have counted Subway and tram use. Not sure if I walk that much. 30km definitely but 86 mhhh. Seems like a nice little addition. I'm hoping this type of thing will become a regular happening. Every few weeks, a new card or two should be added to Google Now. 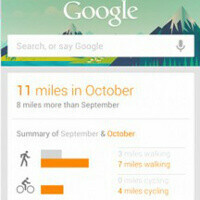 I was checking the weather for today - and my Google now has a card saying I have walked 5 miles - pretty cool.